unusually appealing to low-income voters, especially in the Midwest, compared with recent Republican presidential nominees. There is absolutely no evidence that Trump’s supporters, either in the primary or the general election, are disproportionately poor or working class. It was soon noticed that fascist parties were largely middle class, to the point where fascism was perceived as the very embodiment of lower-middle-class resements...On closer inspection, fascism turned out to appeal to upper-class members and voters as well...the relative scarcity of working class-fascists...[is because] those already deeply engaged...in the rich subculture of socialism...were simply not available for another loyalty. The political explanation here is fairly straightforward: the poor prefer socialism. It's the upper and middle classes who oppose it, particularly in wealthy countries. So when liberal capitalism starts to fail, it's the middle and upper classes who are most likely to turn to fascism - not the poor. If this explanation is correct, then much of the high-profile pundit debate over poor Trump voters has been largely beside the point. While these brackets only approximate "classes", the general trend is clear: Clinton ran up significant margins among lower class Americans, while Trump won middle and upper class Americans by slim margins. This fits the general profile of a fascist movement defined by an absence of support among the poor. Clinton actually outperformed Obama among both the middle and upper classes - but Obama more than made up by this by racking up enormous margins among the lower class. The Romney coalition, meanwhile, fits the economic template for fascism even better than Trump's does - but given the drop in turnout among the poor, Trump's coalition was able to win. This, I think, is the real economic analysis of fascism in 2016: it's about as potent as it was when Romney was the nominee, and it remains eminently beatable. What changed this time around is that Clinton abandoned the economic foundation of the Obama coalition - the poor - in order to run up her numbers among the rich. That's the mistake anyone who wants to beat Trump in 2020 is going to have to own. Out of morbid curiosity, I though it'd be interesting to take a look at how old our presidential administrations are getting. There are all kinds of ways that you can calculate this, but the simplest approach is just to look at the age of the President and his cabinet officials when they take office. For the sake of consistency, I excluded across every administration cabinet positions that Trump has not filled yet; I also excluded the Department of Homeland Security, since it didn't exist before Bush. Trump's administration is currently, by far, the oldest in modern history. It is more than a decade older than Clinton's was, and even five years older than Bush's. The average Trump administration official is on the verge of retirement. Trump has three of the four oldest officials in history: Trump himself is 70, as is his Attorney General Jeff Sessions, and his Secretary of Commerce, Wilbur Ross, is 79. The second oldest official, Lloyd Bentsen, was 71 when appointed to Treasury by Clinton. Even young Trump officials are old: his youngest cabinet member, Treasury's Steven Mnuchin, is at 54 older than the average Clinton cabinet member. 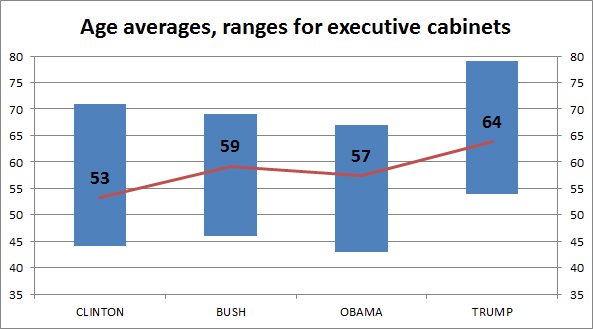 A more exhaustive survey might include all cabinet officials (not just administrative launch teams), as well as other high-level executive positions (such as senior advisors); still, among the most important offices, the modern trend is pretty clear, and it's one that Trump has contributed to dramatically. The libertarians at Reason need to make up their mind: either contracts are sovereign, or they aren't. United's right to bump passengers from overbooked flights is stipulated in the terms of service of its contract with its passengers, which both parties entered into freely. If the passenger had no contractual right to be on the plane, then he was trespassing, and the police had an obligation to remove him - by force, if necessary. In fact, according to libertarians, this is the only thing the police should be doing: enforcing contracts and defending property rights. To get around this merciless capitalist rationale, Doherty tries to delegitimize United's contract with its passengers as "heinous" and "absurd" - that way, he can insist that the police shouldn't have enforced it. But isn't this the move that critics of capitalism always make? Intuitively, most people seem to get that business arrangements can be unjust and grotesque - even ones that both parties entered into freely. We look at situations like a man being dragged off of an airplane, and we realize that something monstrous is happening, even if the logic of capitalism insists that it's okay. That's why critics of capitalism tend to insist that there are contractual arrangements and private property claims that the government should decline to enforce - and in fact, that the government should probably intervene against. The United incident has put capitalists in a uniquely embarrassing position precisely because it demonstrates the kind of horrific, violent outcome you can get when capitalism is enforced. The Trump administration's illegal airstrikes against Syria may very well signal our descent into open war, which means it's time for the antiwar movement to reflect on what can only be regarded as its catastrophic failure. Unless you buy the insane theory that launching 59 Tomahawk missiles doesn't qualify as an act of war, this is pretty abysmal news. To turn the tide, the antiwar movement is going to have to remind Americans that war is a tragedy and a crime even when it isn't a conventional, boots-on-the-ground confrontation. 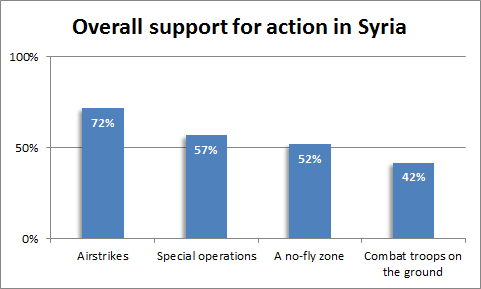 That more Democrats than Republicans support action [against Syria] -- a sharp reversal from the Iraq war, which Republicans were more supportive of -- is likely because a Democratic president is proposing these war measures. Democrats didn't rationalize their support for Obama on those terms, of course. Instead, animated by partisanship, they accepted the logic of Tomahawk missiles: if there aren't boots on the ground, we aren't actually at war. The death of our victims became unreal to us, which as Baudrillard observed more than twenty-five years ago has become the rule of modern warfare: "In annihilating [the enemy] at a distance...it becomes impossible to discern whether or not he is dead." All of this is conventional wisdom on the left. Ask any antiwar organizer, and she'll tell you how much more difficult it is to mobilize opposition when we don't have catalyzing moments like declarations of war or the relentless spectacle of Americans coming home in bodybags. We can wait for that to happen - but there's no reason to believe it ever will, and in the meantime, the missiles are going to keep firing. The prospect of progress in our discourse – that through public deliberation, we can settle on facts, persuade each other politically, and arrive at better understandings of philosophy and morality – remains a central promise of liberal ideology. It is often implicit in the practical argument for free speech, which holds that but for censorship, we can make discursive progress; similarly, it undergirds the liberal emphasis on civility, which sees rudeness as a similar obstacle. It even buttresses the deliberative argument for democracy: through the dialogue of presidential debates, kitchen table conversations, and even tweets, we can compromise and build consensus and arrive at a political understanding that stands for more than just the tyranny of the majority. Here, I’m going to take on three of the major historical arguments for this vision of discursive progress. They are, I think, representative of the larger body of justifications – and they are consistently implausible. The upshot is that there really is no reason to suppose that we can make any kind of intellectual, political, or moral progress through discourse; perhaps such progress is possible, but it is not the discourse that drives it. To clarify, Milton is giving us a list of speech that must not be tolerated. No Catholicism, no superstition, nothing sacrilegious or rude! As Stanley Fish writes, this caveat of Milton’s “is rarely noticed in such discussions and when noticed is noticed with some embarrassment.” It has in any case done nothing to displace Milton from the free speech pantheon; we are to suppose, it seems, that the “classic defense” of free speech has not been compromised, and that this has no implications for our commitment to free speech today. But Milton’s caveat isn’t just some irrelevant tangent – it reflects the narrow and idiosyncratic religious premises on which his entire epistemology is built. He believes that “light and clearer knowledge” are “sent down among us” by God. What makes an argument prevail in the discourse? “Truth is strong next to the Almighty”: it wins by virtue of God’s power. That is why Milton can casually call for the censorship of heretics and sinners; his free speech argument begins with the assumption of God, which means that there’s no need for the discourse to relitigate matters that God has already ruled upon. Within Milton’s call for free speech, then, is a peculiar theory about how progress in discourse works. When people debate about some point of fact or philosophical truth, it is not logical soundness or empirical substantiation or the laws of morality which guarantee that the right position will prevail: it is God’s divine intervention into the debate. Suffice to say that this is not a theory about discourse and public debate that is even entertained by most modern Christians. More to the point, it is one that secular liberals would reject in principle; a pluralistic liberalism cannot begin with the assumption that God is controlling the discourse, and certainly can’t defend a theory that smuggles in calls for censorship against Catholics and rude teens. So it is worth considering why, despite his very illiberal views on discourse, Milton remains venerated as a founding liberal. The answer, I suspect, is simple: the liberal vision of discursive progress is built on an intellectual foundation that we take for granted and don’t reflect on very seriously. The proof is that if we did, we’d notice that the theories behind it are about as antiquated and implausible as Milton’s. According to the traditional liberal view, when we employ our reason we can achieve objectivity: we can see the world as it truly or really is…Liberals influenced by this view of reason believed that free exercise of human reason produces convergence of moral and political views. So rationalism, with its emphasis on logic and evidence, displaced God as the engine of liberal discourse. Once again, speech must remain free; and once again, a major justification for this is the guarantee of intellectual and moral progress, if the discourse remains unobstructed. But this time, the mechanism of progress isn’t divine providence – it’s rationalism, with its emphasis on things like logic and evidence. Mill’s rationalism still finds significant purchase in the modern world. It’s expressed in academia, with its systematic and highly formalized pursuit of knowledge and truth; academics submit to a whole field of norms meant to ensure that discourse remains rationally sound and intellectually rigorous. It’s expressed in journalism, with its elaborate rules of sound investigation and “objective” reporting. And it’s expressed among the general public – especially among elites – in the norms of civil debate and discussion, with their emphasis on substantiveness, their demands for evidence, their fallacy-policing, and so on. All of this, liberalism tells us, will lead to intellectual, social, and moral progress – if only speech remains free. Since the time of Mill, however, multiple challenges to rationalism have emerged. For one, Gaus notes that as a matter of (fairly obvious) sociological fact, we still have different cultures, with different beliefs and perspectives that seem both irreconcilable and stubbornly unchanging. Even where there would seem to be some objective truth at stake – say, when it comes to the imminence of climate change – large segments of the populations are often unpersuaded by appeals to reason. For whatever reason, rationalism often seems completely incapable of driving discursive progress, even in a free speech environment. It’s not really arguable, unless you think we’re angels – but if we’re part of the organic world, we have fixed capacities. Just like I can’t fly. These capacities have a certain scope, and they have certain limits. If this is true, then some of the central focuses of liberal discourse – debates about politics and morality, technical questions about economics and policy, and so on - may simply be too profound and complex for our primate brains to reason about with any rigor and objectivity. We should not be surprised to find Enlightenment philosophers, with their boundless but often blind optimism in human potential, got this wrong – and we certainly have no reason to assume that they got it right. …the Constitution…offers us the possibility of a genuine marketplace of ideas, one in which the “jarring of parties” works on behalf of “deliberation and circumspection”; a marketplace in which, through debate and competition, we can expand our perspective, change our minds, and eventually arrive not merely at agreements but at sound and fair agreements. Obama’s references to deliberation and debate may suggest that he’s still dealing in rationalism, but his metaphor suggests something else. There is, after all, no such thing as a “genuine marketplace of ideas” – that is just an analogy we draw to explain, through comparison with the material economy, how ideas circulate and interact. …academic and popular understandings of the First Amendment have embraced the notion that free speech, like the free market, creates a competitive environment in which the best ideas ultimately prevail…The marketplace of ideas model… remains faithfully wedded to a neoclassical view that depends on a perfectly costless and efficient exchange of ideas. Here, the guarantor of discursive progress is neither God nor reason – it’s the competition and efficiency of capitalism. But explanations like this only work insofar as one accepts the terms and premises of capitalism – which is how belief in capitalism animates and legitimizes belief in a marketplace of ideas. Widespread acceptance of the marketplace theory can be understood to express widespread faith in capitalism; laissez faire attitudes towards regulation and economic intervention generalize into laissez faire attitudes towards regulating and dictating the discourse. Liberalism is that generalization - it merges these two distinct theories into a single ideology. That is why the socialist, who meets capitalism with skepticism, might also regard with skepticism the theory of a marketplace of ideas. For example, socialists have always noted that a firm, within capitalism, can build a monopoly that resists competition – why would this point not also apply in the marketplace of ideas as well? Why not suspect that claims of truth and knowledge can dominate our discourse, not because of some intrinsic value, but because they have become intellectually entrenched, just as a firm is economically entrenched? If this is indeed the case, then there would seem to be some real value in a government that makes illiberal interventions into the marketplace of ideas, busting the monopolies of entrenched thought through censorship. Providence, reason, and marketplace competition – these are three of the major reasons that liberalism has historically given us for believing that our discourse is making progress. This isn’t an exhaustive survey of such narratives, but it is, I think, representative. Certainly, the preceding critiques do not overthrow the case for free speech. One can still argue for liberalized speech rights as a matter of principle, perhaps on grounds of personal liberty (though this is subject to different objections). What one cannot do, however, is insist upon free speech by appealing to the political, moral, and intellectual progress that it supposedly guarantees. That guarantee rests on grounds that no skeptic of Miltonian mysticism, of rationalism, and of capitalism should take seriously.